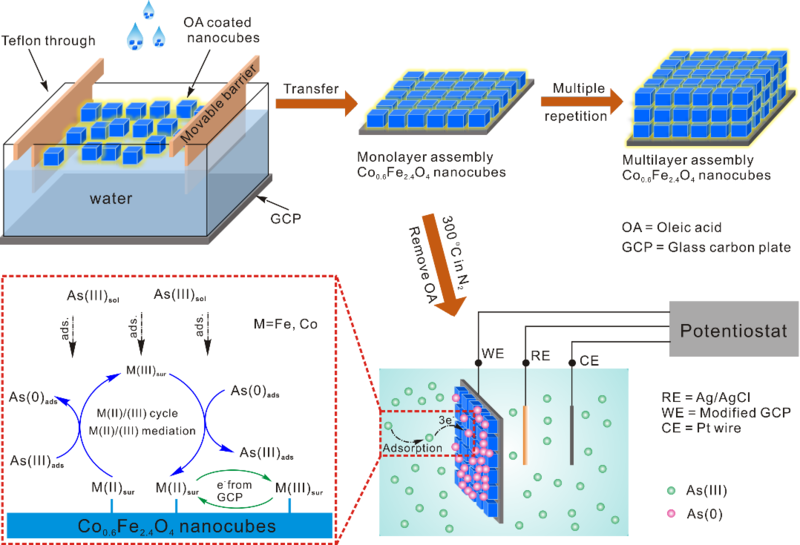 In a paper published in Analytical Chemistry, the study team jointly led by Prof. HUANG Xingjiu from Institute of Intelligent Machines, Hefei Institutes of Physical Science, designed highly sensitive electrochemical detection of As(III) in drinking water by Co 0.6 Fe2.4O4 nanocubes self-assembly monolayer. Decreasing the size of nanomaterials and introducing the surface defects both could greatly improve the electrochemical detection performance due to the nanosized effect-induced specific electrochemical properties. However, nanocrystals generally suffer from the agglomeration because of the spontaneous reduction of the system surface energy, which blocks the active sites from reacting with target ions and severely reduces the electrochemical sensitivity. In this work, ~14 nm Co 0.6 Fe2.4O4 nanocubes with a high density surface defects are facile synthesized and then easily self-assembled on the surface of working electrode. The fabricated highly homogeneous sensing interface were successfully used to detect As(III) with a considerable sensitivity. 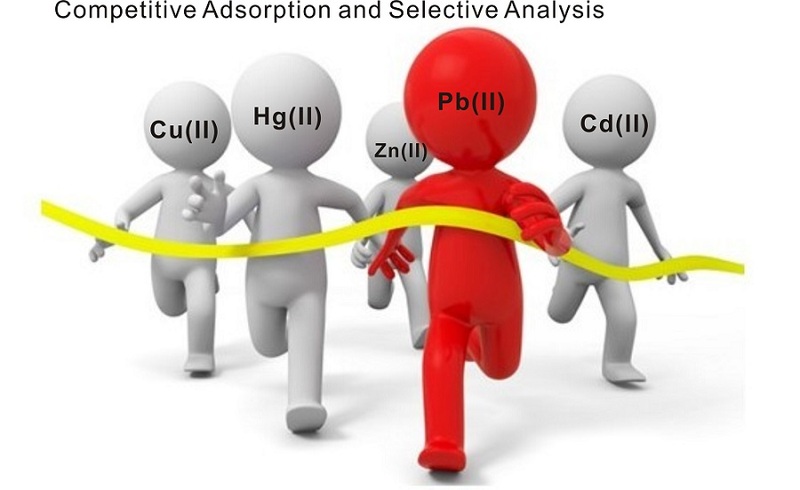 The high adsorption and the good redox activity of Co 0.6 Fe2.4O4 nanocubes caused by the surface defects are strongly proved by X-ray photoelectron spectroscopy (XPS) and the addition of Fe(II) and Co(II) during the detection. Owing to the exist of surface defects, Co 0.6 Fe2.4O4 nanocubes exhibit high adsorption to As(III) and the fast redox of As(III) which has been demonstrated by XPS. The increased stripping current as the addition of Fe(II) and Co(II) suggests that the mediation effect of Fe(II)/(III) and Co(II)/(III) cycles on the surface of nanocubes could benefit As(III) analysis. Furthermore, the monolayer perfectly overcomes the agglomeration of nanocrystals during electrode modification, ensuring the exposure of active surface area on nanocubes to the largest extent. Most importantly, this approach of tunable distribution of the nanosized defective nanoparticles on electrode provides a new opportunity for modifying electrodes without agglomeration and keeping the active of surface defects. This work was supported financially by the National Natural Science Foundation of China, the youth project of National Natural Science Fund of China, the CAS Interdisciplinary Innovation Team and the CASHIPS Director’s Fund for financial support. A research group led by Prof. LIU Jinhuai and Prof. HUANG Xingjiu at Institute of Intelligent Machines, Hefei Institutes of Physical Science reported their discovery in detecting Hg(II) through TiO2-based electrode without other modification need. 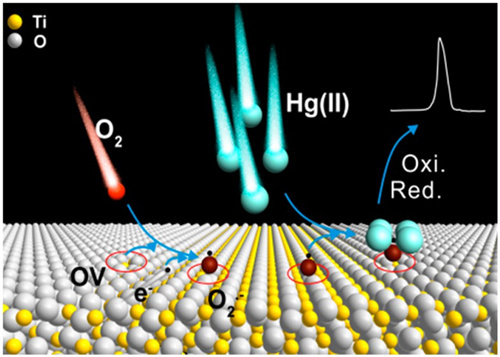 In a paper published last week, HUANG Xingjiu's study team at Institute of Intelligent Machines, developed selective electrochemical detection of Pb(II) with nano-Fe/Mg/Ni ternary layered double hydroxide (Fe/Mg/Ni-LDH).